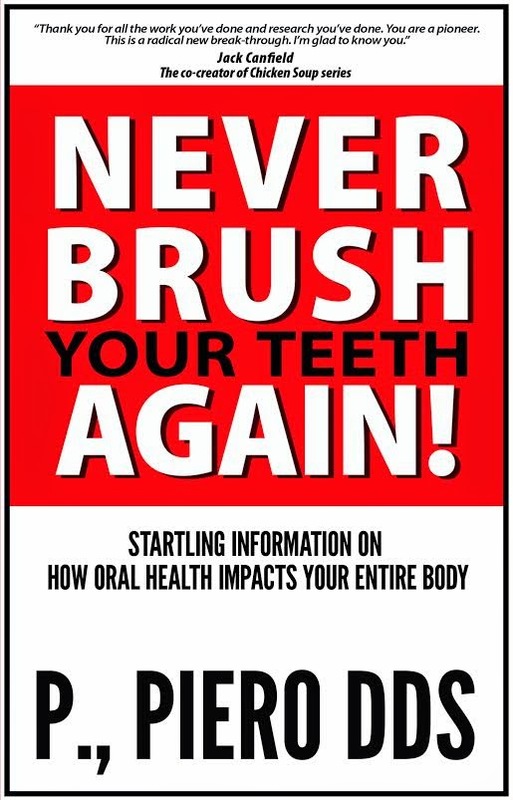 P., Piero DDS, Author of Never Brush Your Teeth Again! Today we are interviewing P., Piero DDS, author of Never Brush Your Teeth Again! - Startling Information On How Oral Health Impacts Your Entire Body. Dr. Piero is a 1982 graduate of the University Of Detroit Mercy School Of Dentistry with a family practice in Holland, Michigan. He has steadfastly placed a special emphasis on periodontal disease and restorations. His patients will tell you he is passionate about patient education and total body health and wellness. Since 1984, Dr. Piero has used his clinical experience in the development of Dental Air Force, a sophisticated, personal, at home dental hygiene system that represents the biggest leap forward in personal hygiene and periodontal disease prevention and treatment since the invention of the modern toothbrush in 1939. Dr. Piero developed and created Dental Air Force based on professional dental hygiene equipment – the Prophy Jet™ - that can “power wash” away plaque, remove microscopic debris from between teeth, and disrupt the biofilm that grows on teeth and produces periodontal disease. Dental Air Force has been heralded as a major advancement in home oral hygiene care that can help people of all ages prevent periodontal disease, preserve teeth, and improve overall health and longevity. The main objective of the book is to make its readers aware of the pitfalls that traditional tooth brushing can pose. It explains, in detail, how and why brushing can be harmful. Despite being taught to brush our teeth twice a day ever since we were children, this book brings out the hidden truth about tooth brushing. It not only makes us aware of how to defend our body against the harm caused by brushing, it also suggests an alternate way to keep our mouths healthy and clean. It does a wonderful job of guiding us towards the right way of taking care of our mouth. With each chapter of the book, one will find new information unfolding in front of them - information that you may never have known or that you never even thought existed. “The Zoo in Your Mouth” chapter tells us about all the bugs our mouth harbors and all the threats that might be present in a dormant state in the mouth. There is a chapter on the biofilm ecosystem and most importantly on periodontal disease. Other chapters describe the relationship between periodontal disease and systemic diseases that affect the entire body. The book gives us a very clear idea of all the existing threats to our body as well as to our immune system. The book is a life saver. Studies show that tooth brushing can lead to serious abrasions on the tooth enamel. This is not just a statement – there is scientific proof. Anyone that uses a toothbrush! Anyone with teeth that cares about their (and their loved ones) overall health will benefit from reading this book. This book helps you understand what’s going on in our mouths and helps spread the word about deadly disease that can be prevented by switching up our oral hygiene routine. What inspired you to write a book about the ineffectiveness of the toothbrush? Periodontal Disease is the most prevalent disease on the planet, yet almost 50% of Americans over age 30 have periodontitis… according to the CDC. And if you are age 65+ the numbers jump to 70%. Dentistry is not only my career, but my passion. I take Dentistry to a higher level by talking to each and every patient about their overall health history and reminding them that the condition of your mouth is linked to the health of your entire body. I take pride in my work in prevention and periodontal disease therapy. It took me two decades to get to this point and share my device- a toothbrush replacement and solution to preventing periodontal disease at home… a new way to clean your teeth without the damage! Seeing as how I cannot be everybody’s Dentist, I wanted to write this book to get the word out to more than just my patients. Why do you think society has so heavily embraced the toothbrush as a cure-all for dental health? I wish I could tell you… I’m trying to change the mindset though. The bristles of these toothbrushes drag the abrasive toothpaste across your teeth- scratching the surface of the enamel and dentin leading to many problems including sensitivity. On top of that, they cannot clean many hard to reach surfaces. You write about the bio-system of bacteria, viruses, yeast, and parasites in the mouth and how they are dangerous. Tell us a bit more about this. Not all of these microorganisms are dangerous! Some are beneficial, but many are contagious, smelly and infectious. Even after a professional cleaning by your dentist, it only takes 24-48 hours for all of the bacteria to return. There is an amazing return on investment when you put your money where your mouth is. You live longer… You live healthier… Prevention is the key to unlocking the vault of longevity within each of us.